* I normally read around three books at a time. Sigh. Yes, yes, I'm a nerd. ** Naturally, follows from the explanation above. # Technically, on my office desk. Took a cab to work this morning, and didn't drive, just so that I could read en route. Bought myself a half hour of solid reading time. Hurrah! 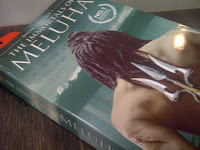 I hope u loved Meluha!!! I fell in love with Shiv post that book!! !